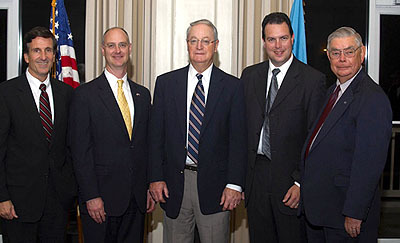 Justice Randy J. Holland, Carl C. Danberg, Attorney General, Justice Joseph T. Walsh (retired), Chief Magistrate Alan G. Davis, and Judge William Hopkins at the Justice of the Peace Court’s 40th Anniversary Celebration, which was part of a two-day educational program held in November 2006. When the Justice of the Peace (JP) Court celebrated its 40th Anniversary this November, it also celebrated 10 years of the Court’s Legal Education Program. The Legal Education Program prepares and trains justices of the peace for their role as judges. It consists of an introductory program for new judges as well as continuing education for current judges. The Program begins with an intensive 11-week training program, called the Basic Legal Education Program or BLE. This program gives new judges background in the legal concepts they will need on the bench. The program consists of a criminal module and a civil module. Each module includes mock trials, observation of current cases and trials in JP Court, and classes taught by currently sitting judges. At the end of each module is a written exam. According to one recent participant in the program, it prepares new judges extremely well. “BLE was a definite help; it gave us tools and it gave us insight into the new job we were taking on,” said Judge Dwight Dillard. Judge Dillard was appointed in June of 2006 and, after completing the BLE program, began hearing cases in September. Prior to being appointed, Judge Dillard was a JP Court clerk. Judge Dillard said that because he had been a court clerk he was familiar with the terminology, but he still had a lot to learn during BLE. 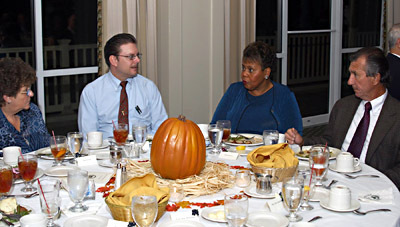 Judges Jeni Coffelt, John McKenzie, Marcealeate Ruffin and Edward Davis at the Justice of the Peace Court 40th Anniversary Dinner held on November 13, 2006, in conjunction with a BLE seminar. After completing the BLE program, judges must complete continuing legal education requirements throughout their tenure on the bench. One such opportunity was a recent education conference, held November 13-14, 2006. During the conference, judges learned about new police tactics to combat DUI and what the police and Division of Motor Vehicles were doing about aging drivers. There were seminars on ethics, constitutional law, and evidence. In addition, Chief Magistrate Alan Davis and Attorney General Carl Danberg spoke to the judges about issues particular to the Justice of the Peace Court. The Justice of the Peace Court is often a citizen’s first encounter with Delaware’s court system. This is because the JP Court’s jurisdiction includes warrants, DUIs, and civil claims up to $15,000. They also have exclusive jurisdiction over landlord-tenant disputes. After a rigorous screening process, the Governor nominates JP judges for an initial four-year term. Subsequent terms are for six years. Currently there are 60 judges serving at 19 JP Courts throughout Delaware.